Andalusia, the southernmost region of Spain, is one of huge importance to Spain. The beautiful area not only houses around twenty percent of Spain’s modern population; its traditions and history range from Moorish rule in the distant past to a vibrant and contemporary big city culture today. Home of archetypal Spanish classics like the Flamenco, they also make a damn fine garlic soup – Ajo Blanco, or white gazpacho. If you’re looking for a cold, Spanish, garlic soup that hits all the right spots in a hot, long summer, then search no further – you’re in the right place. 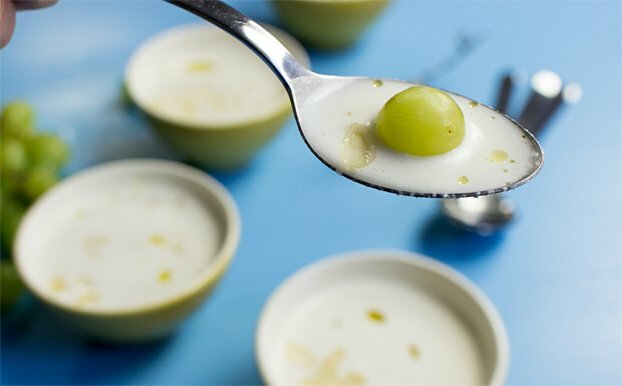 Ajo Blanco (otherwise known as white gazpacho, even though the name means ‘white garlic’) has been around for a long time, and is exceptionally popular in its home regions, among others. 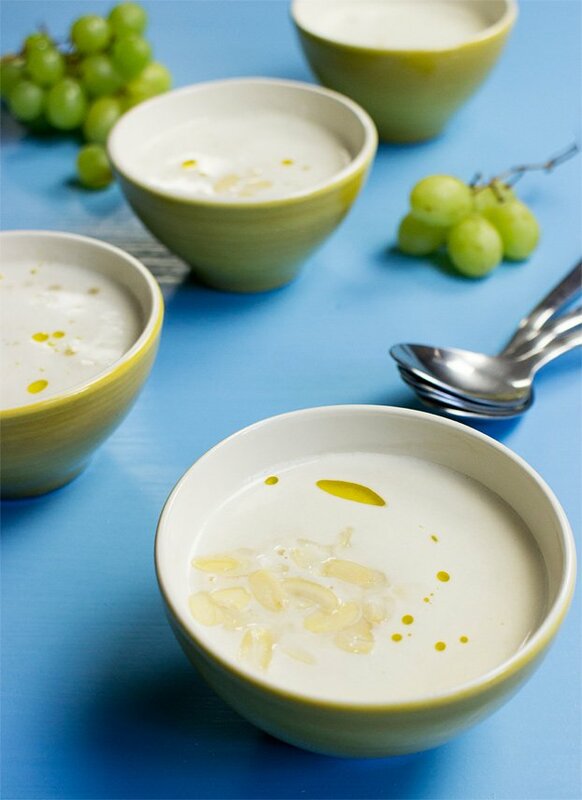 This white gazpacho (I love calling it that) is an unusual one indeed (well, to those outside Andalusia) – with chief ingredients being almonds, bread and grapes. 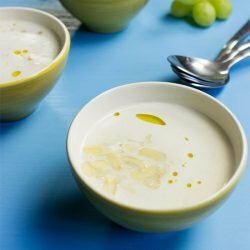 The almonds and bread make a milky, soft soup base with just a hint of sour, while the addition of grapes mean a kick of fresh fruitiness in every bite. 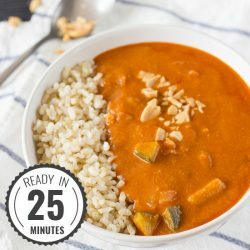 Spanish garlic soup is something different, no doubt! 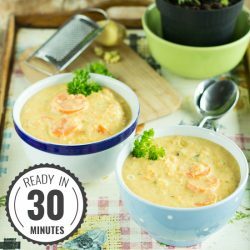 More good news is that this soup is incredibly easy to make, and provides a welcome, stress-free starter on those warm evenings. Bread is soaked in water, then it’s all blended and left to cool. Grapes are added, and boom, done! We recommend using already blanched (peeled) almonds; they’re very easy to find in most areas. If you can’t find any for whatever reason, then just cover your unpeeled almonds in boiling water for a few seconds, then remove and let cool. The skins will be slightly ‘wrinkled’ and you can easily squeeze the skins off. Also, if you have bread that has started to harden or go stale – perfect! No need to waste it – use it for the garlic soup. The soaking will soon soften it up. Although Spanish cuisine is not overly noted for its vegetarian or vegan varieties, this Ajo Blanco is friendly to both. The inclusion of almonds is a great health boon too. Almonds are high in monounsaturated fat, which has been shown to reduce the risk of heart disease. Almonds are also helpful in the fight against type 2 diabetes, believed to be so because of its low-glycemic index. 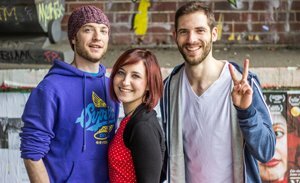 Almonds and other nuts have been used extensively in food-health studies, and a great round-up of the results and interpretations can be found here. The original white gazpacho soup hits all the right boxes - it’s cold and fresh with the perfect balance of sweet vs sour. It’s vegan-friendly too. Soak the bread in water in a large bowl. To get the soup as white as possible you can use white bread and separate the middle from the crust after it’s soaked. For whitest results, only use the middle. Add the almonds and garlic to a food processor or blender with a few tablespoons of water and blend well. Add the bread, olive oil, white vinegar and any water that’s left. Add salt to taste and blend until smooth. Ideally cool the soup in the fridge for a couple of hours. 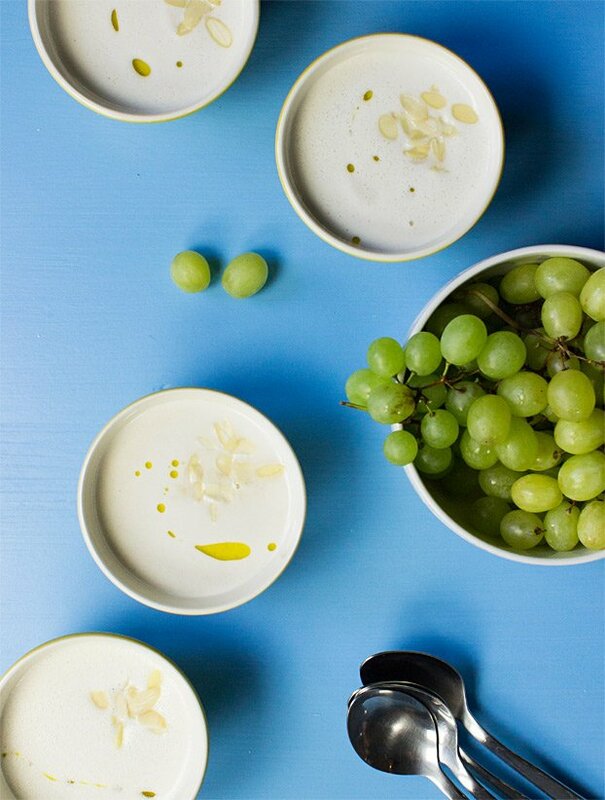 Serve, adding a handful of grapes to each bowl. IF YOU LIKED THIS RECIPE: Then you definitely need to check out some of our other appetizer soups like this absolutely irresistible Pea and Mint Soup. It’s put together so easily as well. 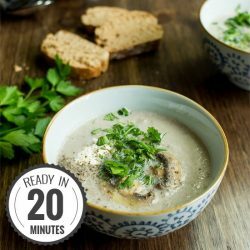 Or try out our Mushroom Soup - it’s been a starter at many of our dinner parties already! Traditional recipes like this garlic soup are something special. Thanks Cris for introducing us to the Andalusian cuisine! If you happen to be in Barcelona and want to explore more authentic Spanish food you should definitely contact her :-).